I’m in the City on a blustery Friday night at the close of what has been, frankly, a rather depressing week globally speaking (yes another one) but the weather doesn’t dissuade gaggles of junior city boys wrapped up in their winter uniform of Barbour and Superdry jackets from nursing pints whilst clustered in groups outside the pubs of Fleet Street. Weaving in and out of the various huddles as I make my way through the winding alleys that flank Fleet Street and I’m starting to despair of ever finding my destination. St Bride’s Avenue, St Bride’s Place; it’s a veritable warren. One last turn down the small passage of St Bride’s Court and it’s there; Merchant House of Fleet Street. Any fears I had harboured that a whisky bar in the heart of the City could only possibly be populated by red faced noisy conversations of golf courses and competitive Speyside versus Islay debates were quickly allayed. Merchant House is a softly lit haven of comfy velvet covered chairs and not a braying idiot in sight. For, whilst Samuel Johnson may have said that when a man is tired of London he is tired of life, this girl can tell you she is definitely tired of standing around outside London’s bars. What I need in the onset of my elderly dotage is a nice corner table where I can survey the territory and ask kind people to bring me food and drinks. I’d like to think that Dr Johnson would have agreed with that sentiment. The bar’s website proclaims a list of over 500 whiskies and an entire high-ceilinged wall is dedicated to shelf after shelf of amber nectar. Bottles are sorted by approximate price from left to right and the higher up the shelf you go the higher the price. This saves any embarrassment of realising that you’ve just ordered a rare whisky the price of a shot of which could be the GDP of a small country. The food list is minimal- think cheese platters, smoked salmon, saucisse and the perhaps comparatively more esoteric honey glazed octopus- but provides enough sustenance to get you through another cocktail before leaving in search of more robust belly-filling delights. What did come as a surprise was how approachable the bar made whisky; the (all female) staff were eager to talk about what style of whisky you might like and recommend cocktails to fit your taste. Whilst cocktails are imaginative, well made and beautifully presented they aren’t cheap at around £12 each. My favourite was a Tartan Pimpernel; a blend of Islay whisky, bee pollen & raspberry wine with a spot of aloe water. A most odd combination of ingredients to have dreamt up but it worked very well. The Emigre was also a surprisingly light cocktail (pot still whisky, apple, rhubarb & elderflower). More traditional whisky based classics are also on offer- an old-fashioned was beautifully made. Despite the Scottish sounding cocktails, the whiskies on offer go well beyond the shores of the UK and Ireland with a good range of bourbons and Japanese whiskies too. A particular favourite with our group was the 1792 from Bardstown in Kentucky, oozing vanilla and sweetness making a great contrast to the smoky Islay whisky I’d been sipping on earlier. This bourbon comes with pedigree having been awarded an IWSC Gold award in 2013 as well as whole host of other accolades. You can find out more about it here. 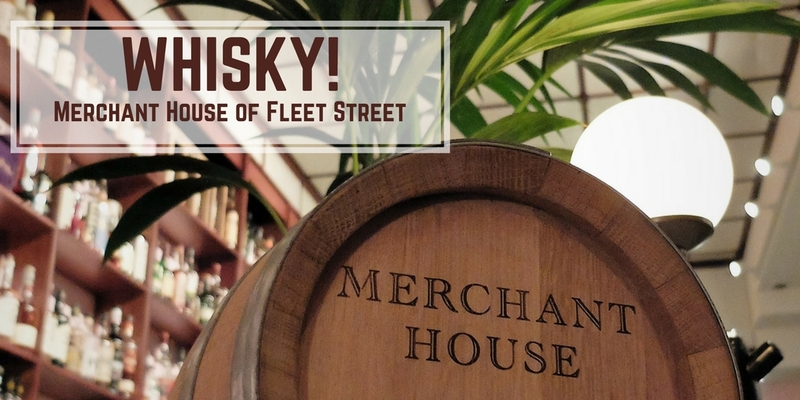 The same team have another bar down the road at Merchant House of Bow Lane specialising this time in rum and gin. A visit is on the cards very soon…. 8 Bride Court, London. EC4Y 8DU.